She may be only fifteen but Delcyna Kanisha Morgan is already turning heads with her art work. Last Saturday, the Cultural Arts Studio of Afro-Caribbean Dance on Colonnade Road, with proprietor Suzan Lavertu, hosted a selection of Delcyna’s work. With the ice-cold winter storm weather conditions prevailing that evening, only a small handful of people made it to the venue. But those who did, were certainly warmed by the amazing work of this young emerging artist, who will certainly be a name to watch for in the future. From portraits to landscapes to graphic wildlife, Delcyna’s powerful images evoke a vivid sense of realism that both captivates, provokes and inspires the viewer, transcending the run-of-the-mill pieces sometimes witnessed at art exhibitions. This shy, beautiful, talented young woman will certainly be making waves in Canada’s art world over the next few months and years. And it was only fitting that her first public exhibit was held on her 15th birthday, with her mum Marie-Daphne Laguerre, and grand-parents, Marlene Laguerre and Louis Laguerre, joining in the double celebration. 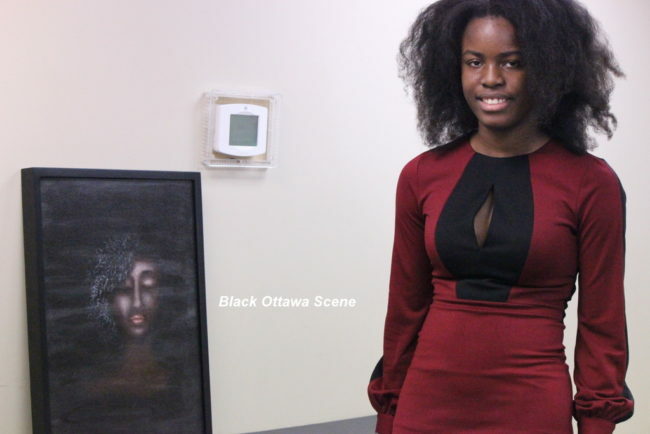 Black Ottawa Scene was there to capture those special moments and engage Delcyna and her mum in conversation. Happy birthday Delcyna and how are you feeling today? Can you tell us about your career. How long you have being practising your art? I started drawing at a very young age and I started painting by the age of nine. Did you take art lessons in school? Actually when I was nine I had painting classes but except for that, I never had real lessons, so I just practised by myself. Is this your very first show? How do you feel about today’s show? Why did you choose the Cultural Arts Studio? Because it is a very well-known place in the community. Let’s talk to your mother. Hello Mrs. Morgan, How are you doing? I am very well thank you. Let’s talk about your daughter, Delcyna. You must feel proud of her. How do you feel about her art show this evening? I feel really great. It’s a good opportunity to showcase her talent and it’s her 15th birthday and it’s just a great opportunity for such an event and I am very very proud of her. She says she’s been painting since the age of nine What has our family done to encourage her, were you pleased or were you worried that she might be going into the wrong profession? Actually, no. When I noticed her talent from the time she was about eight and I noticed the precision with which she was drawing and from that moment I wanted to reach out and let her explore her talent. When she was about seven or eight, she was dressing her dolls with clothes that she had make by hand. And from that moment, she started taking sewing classes. I feel strongly that her talent mixed with good business acumen would take her as far as she wants. We are really one hundred per cent behind her. I really don’t believe that art is a poor profession, it can be just as rich as any other profession. We just have to make sure that she is well surrounded with mentors who are in the field. What are you hoping for her in the future? She is only fifteen right now; when she turns 18, 19 or 20, what are you hoping for her to achieve? It’s really up to her. We’re one hundred per cent behind her, her father and I. I am just hoping that she would explore her talent to the full extent because she draws, she paints, she does clothing design, the world is hers. Whatever she comes up with we will always be proud of her. Have you made any efforts to connect her with other mentors like people who are well established painters? Not really. However she is part of the Afro-Caribbean Cotillion which is sponsored by Suzan Lavertu and the Cultural Arts Studio and among the mentors there is an artist and a designer and we’ve already made some connections who will be working with her. Who knows, the future is just beginning. You know that the arts world is a very difficult place to be in, particularly for people of colour. What kind of support are you offering her in order to navigate this area, seeing as it is not one of the easiest professions to get into?. I agree to a certain extent but what reassures me is that Delcyna is very strong in Math. One thing that we insist on is that she take a business course to really know how to market herself. And also because she is multi-talented, she has great potential, and again it’s really up to her to determine what she wants to do and not worry about the negativity that art is difficult. It may be difficult but it could be like a perception, but it is something to explore, putting her energy into it. You know there have been so many cases of people who go into the arts and don’t succeed. They then find that there is really nothing else left for them to do because they had pinned all their hopes on art. How would you encourage her in case things don’t go the way she wants? Good question. I personally feel strongly about following your passion. Whatever you’re good at, you just have to go and give it your all. Doors will open but you have to believe in yourself. Let’s go back to Delcyna. Now that you are 15, what grade are you in school? I am in Grade 9. How do you see yourself by the time you’re in Grade 12? Do you plan to go to university? I am not sure for now. Would you want to pursue your art well into university and much later in life? Is there any message you would like to give our readers? Our readers would like to know a bit more about you. This is the Black community in Ottawa and we always like to promote new talent. Maybe your mum can help here, Mrs Morgan? To the community, to the youth out there who are talented and artistic, there is a place for you in this world, you just have to believe in yourself. There are community leaders out there who are here to help you showcase your talents. So just go for it.